There’s clearly a big risk associated with handling some of the substances that are deployed by businesses in an industrial setting. Jobs in manufacturing, engineering, medical and chemical research and many other fields could, without due care and attention, put workers in harm’s way. That’s why businesses must ensure they’re doing all they can to be protected against the potential hazards that come through working with chemicals. But, what should you do to avoid injuries and accidents that could prove costly from a financial, emotional and reputational point of view? The use of chemicals is often governed by strict rules and regulations and that’s for good reasons. Businesses have to be aware of the rules governing the use of any chemicals handled as part of their operation, including any changes that occur. Ignorance really is no excuse. Contact the Occupational Safety and Health Administration (ran by the Department of Labor) if you’re not sure. Your business is only as safe as the people who work for it. That means that you have to have a robust training program in place to make sure that everyone in your organisation is properly aware of their responsibility. Keep a record of everyone’s training and arrange regular refresher courses, especially if there have been any changes to the rules and regulations in your field. 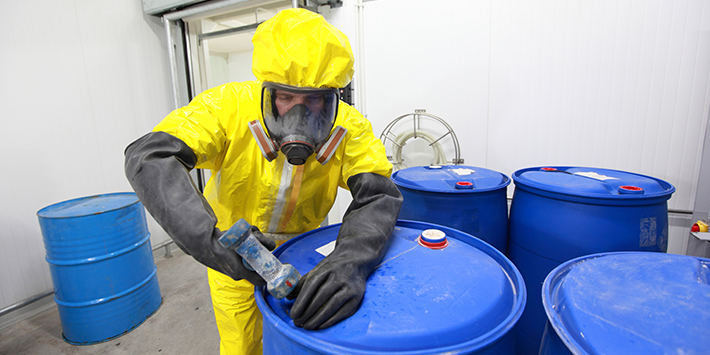 How are the dangerous chemicals in your business stored? How are they transported? What equipment is used alongside them? All of this matters. You need to make sure that the way in which you store and use such chemicals is safe and that might well mean replacing and repairing the equipment you use alongside it from time to time. It’s also vital that you have a healthy attitude to communication. Staff need to know who to talk to – especially if they’re raising issues with the sorts of matters above – and management needs to have an effective channel through which to convey any changes or safety information. Jostle looks at seven ways to improve internal communication if this is a problem for your business. It’s important to do all you can to mitigate the danger associated with handling chemicals but there is another way of proceeding if you want to operate in a safer way – you could search out newer working practices. People are constantly trying out new innovations to change the way we work and these normally make life cheaper, quicker, greener, safer or all of the above. Just look at Airblast AFC and you’ll see how blasting and painting has become much safer in recent times. Always be on the lookout for the latest ways of working as these are likely to incorporate the safest practices. With a thorough knowledge of the rules and regulations, an up-to-date training program, the right equipment and a good communication policy you’ll give yourself a good chance of staying safe with dangerous chemicals. However, keep an eye out for new ways of working and you might be able to scale back your exposure to these chemicals in the first place.